In every child’s life there is a toy that becomes a friend and in our house that toy is Mette (although her name has been changed to Sally by Mouse). Mette is a little scamp doll from Haba, a fully material doll with lovely colours, fun clothing and a wonderful air of quality. She is very well made and even after having been flung about and being cuddled to within an inch of her being, the seams are well and truly secure. She is beautiful with a shock of orange hair (much to Monkey’s delight as it matches his) and is lovely and soft! Mette has provided endless amount of fun and is great for inspiring imagination! The best bit for Mummy is that she is also washable! Mouse has danced, played, sang, cuddled and more with her new found friend and I think she will be a member of the family for a long time to come!! IzziwizziKids.co.uk was born way back in 2005 when Al Boxall-Gordon (a new mum at the time) who was finding the world surrounding children, toys and play frustrating, from this Playfest arrived in January 2011! Playfest is a party on Twitter (Tuesday 8.30-9.30pm) and Facebook (Thursday 8.30-9.30pm),where a group of like minded people who LOVE play join together to chat about play ideas, their own fun week, occasions (e.g. Christmas, Easter), reviews, sometimes cake and more! I wanted to tell you that something exciting is happening for Playfest, well actually something exciting is already happening – it is growing!! So, Izziwizzi are opening up the floor and asking for anybody who is interested to apply to become a Reviewer for the Playfest! You don’t have to be a blogger to do it, you just need to love play, be willing to give honest feedback, be able to do video reviews and submit them on time and attend Playfest to join in and give your views! So if you fancy it, crack out the video camera, phone or you other video recording equipment and join in the fun! 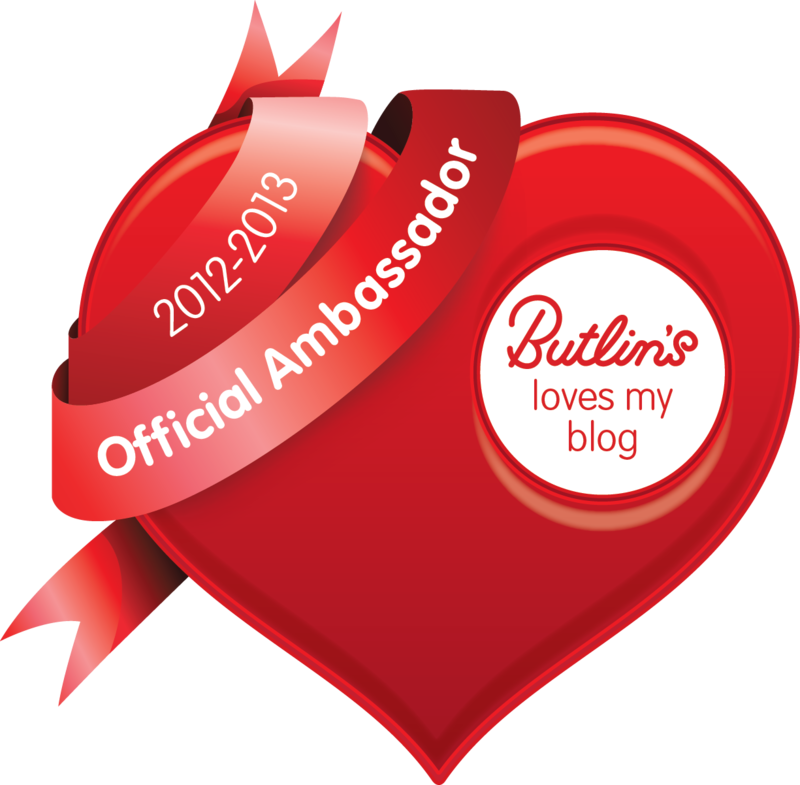 Find out more from the website, the Facebook page and the twitter feed! 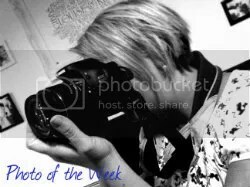 Kel of Writings, Ramblings and Reviews Blog kindly volunteered Izziwizzi to create a guest post on her blog today which I was so pleased about. Kel and I have known each other now for 2 years because of one thing that originally connect us and that is a passion for play. For those of you not familiar with Izziwizzi Kids or Play Fest I am Al Boxall-Gordon of the Izziwizzi Kids Play Fest. I’m a mum of three children aged 8,6 and 4 and host the Play Fest which is a FREE weekly event on Twitter and Facebook. As part of building this up over the last two years I have also established a social media marketing business Buzz Internet Marketing supporting brands and businesses to use social media effectively to get closer to their customers. Play Fest is an opportunity for all families to get involved and have a say about something topical in the field of toys, games and play. We get brands, retailers, bloggers…you name it involved. We partner up with lots of fabulous brands and retailers to giveaway lots of goodies and discounts. Kel first got involved in Play Fest in my first ever one that I held back in January 2011 and has grown with it from there. When it has come to designing the Play Fest, Kel has been there, when it’s come to improving it…Kel has been there, making reviews…Kel is there, when it’s come to making play ideas..Kel has been there…In fact when Play Fest has needed anything…Kel has been there armoured with a nice big slice of cake and a glass of wine! Kel brings a nice chill out tone to Play Fest and that always amazes me as she juggles this with a very busy life, moving house, raising the kids and all the other stuff life brings and yes still manages to make to Play Fest. If for some reason she’s not as active…yes she still comes along and says hi and tells us. Kel has also been known to be amazingly brave at hosting a Play Fest or two to to give me a little time to myself now and again and to that Kel…I am eternally grateful. I’d like to invite you to get involved in Play Fest with Kel. It’s FREE! It’s every Thursday evening on Facebook and every Tuesday evening on Twitter. It’s easy to access via any computer, tablet or mobile phone. You can find more details by following Izziwizzi on Twitter or liking the Izziwizzi Kids Facebook Fan Page. Over the coming weeks you can enjoy Play Fest with Slow Toys (with Selfridges) and Galt Toys with some stocking fillers for Christmas. Follow Izziwizzi Kids to keep up with more exciting things in the pipeline. The Hape Coffee Maker is a beautifully made wooden toy and if i am honest – I have fallen a little bit in love with it! There are 6 parts to the toy, the main coffee machine, a cup, sugar bowl, spoon, carton of milk and a coffee filter! It has that special quality that comes with being a wooden toy. It is lovely to look at, has a fab finish, the colours are vibrant and it almost invites you to play just by being so attractive! It is a fantastic toy for imaginative play, imitating the grown ups and learning about the world! I am sure it will provide hours of fun! It is really awesome and a perfect toy for Father Christmas’ list! 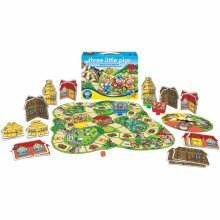 A board game from Orchard Toys, Three Little Pigs is aimed at ages 3-6 year olds and it is fab! It is a board game and the aim is to build your three houses (one of straw, one of sticks and one of brick) before making your way to the safe house in the middle to win! The main playing board is actually a jigsaw so the fun starts before you have started to play with putting together the bits! It is a turn taking game where you roll the dice and collect the materials for your houses, each house has two bits and are easy to put together. There is a wolf that might get in your way though, land on him and you have to spin the spinner – he then ‘huffs and puffs’ and may take a piece away! The pieces are made from a sturdy cardboard, nice and thick and not easy to damage! Monkey and I played this game three times in a row, it is long enough to entertain and short enough to keep the interest! Monkey said it was the best game he had and that he wanted to play it again (and again and again). In the end I had to tag team Daddy so I had a break! This game is brilliant, easy to play, nice and colourful, strong and most of all fun! Disclaimer: I was sent this game for the purpose of a review for Orchard Toys as part of the IzziwizziKids.co.uk Playfest, however this has no bearing on the review and all opinions are honest! 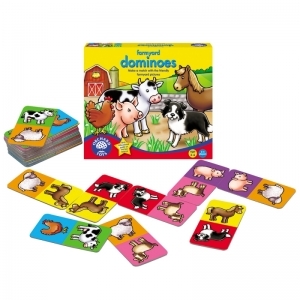 Farmyard Dominoes from Orchard Toys is a perfect first dominoes game for any little one, the pieces are bright and colourful and the animal illustrations are easily recognisable. There are 28 cards made from sturdy cardboard; they are not daily bent and appear to be wipe clean! The game is great for encouraging matching skills and turn taking! We added in making the animal noises when you made a match too just for fun! The age guide for the game is 3-6 and this is about right, 2 year old Mouse did join in and enjoyed playing but it took a couple games for her to getting the lining up (although the matching part she got straight away!). We have really enjoyed playing this as a family and would recommend to others! The game retails for £9.50 and I think you will definitely get your money’s worth! 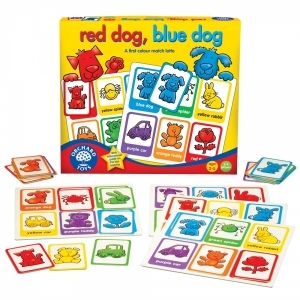 Red Dog, Blue Dog is a first colour match game from Orchard Toys. In the box you get four playing boards and 24 coloured cards. Each player has a board and the coloured cards are placed face down, each player then takes a their go to turn one over, if it matches pop it on your board and if it doesn’t put it back! The winner is the first one to fill their board! The pieces are made of sturdy cardboard and are a lovely size for little hands and the simple rules means that the age guide of 2-5 year old is spot on. Both Monkey and Mouse loved playing this game and really got into looking at the pictures and trying to remember where they had been put back! It is a great game for matching colours, pictures and to exercise your memory! It is fun and the kids loved it, they played the whole game with no faltering and want to play again often! The game retails for £9.50 and I would say it definitely needs to be on the Christmas List of your little ones!